I'm all for traditional apple pie, however pies feed a crowd and can be a bit cumbersome to finish when only one of you likes pie. I also don't like a ton of crust so I opt to go with pies topped with a crumb topping. 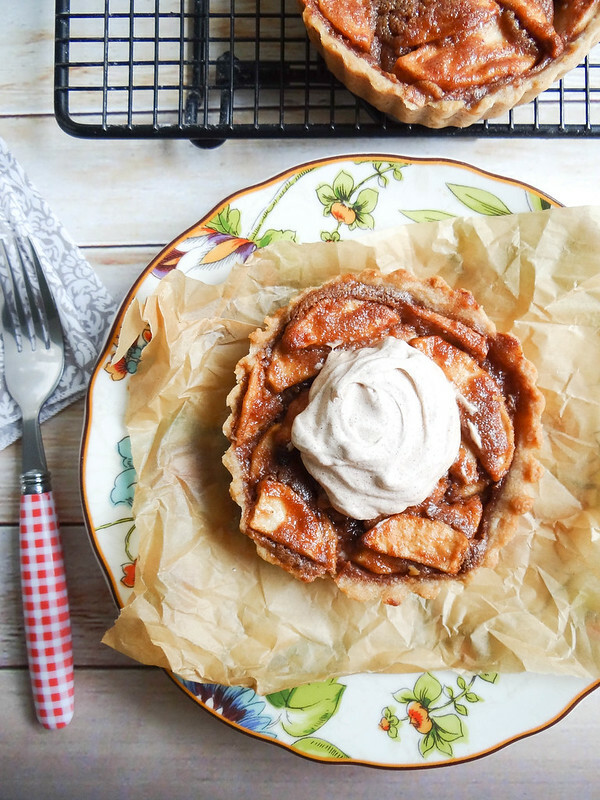 This tart is completely different from anything I have made that has anything to do with apples. Peanut butter and pure maple syrup are melted together with a bit of butter. 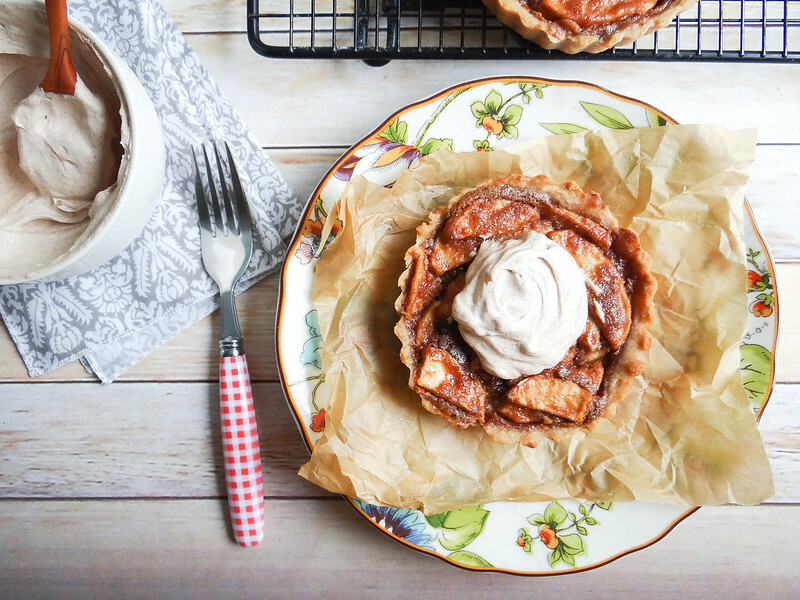 The apples are tossed with cornstarch and cinnamon. 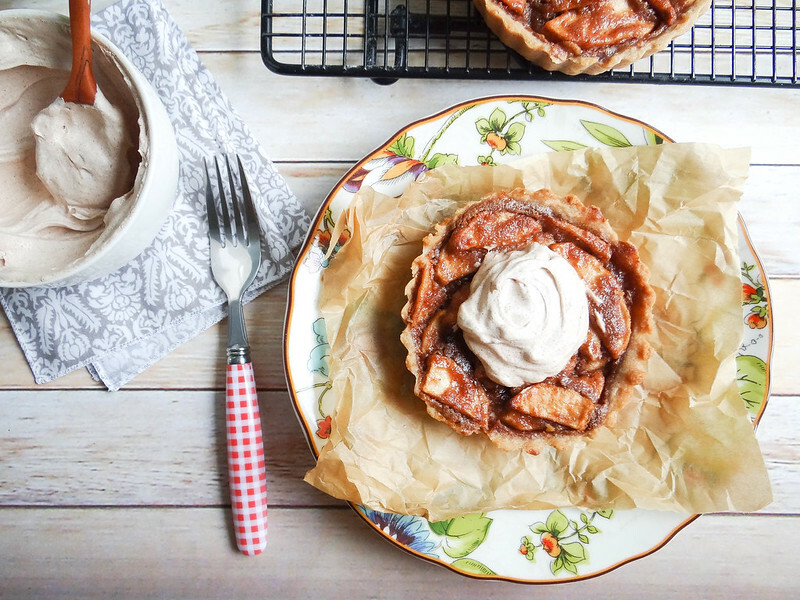 A simple no fuss tart dough is turned out of your food processor or blender in a blink of an eye. The Tart dough has no need to chill in the fridge and you don't need to mess around with having to roll out a dough which can be challenge for many people. 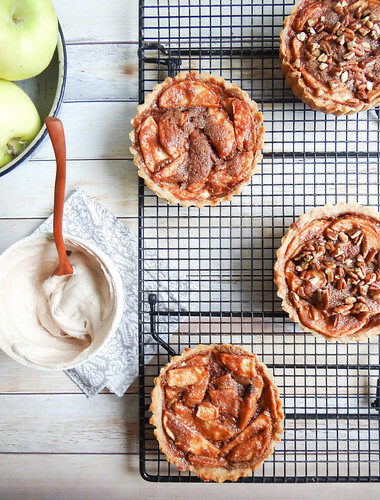 You simply press into mini tart pans and call it good. 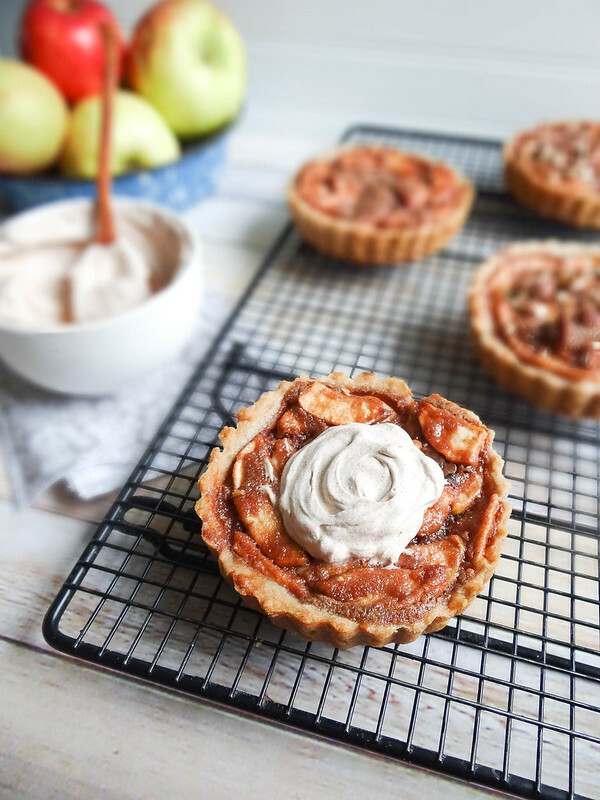 The mini tarts bake up with the option of adding a few pecans to the tops during the last 10 minutes of baking + the grand finale of cinnamon coco whipped cream to finish it off- or a scoop of vanilla vegan ice cream! The little tarts didn't even make it a full day in our house. 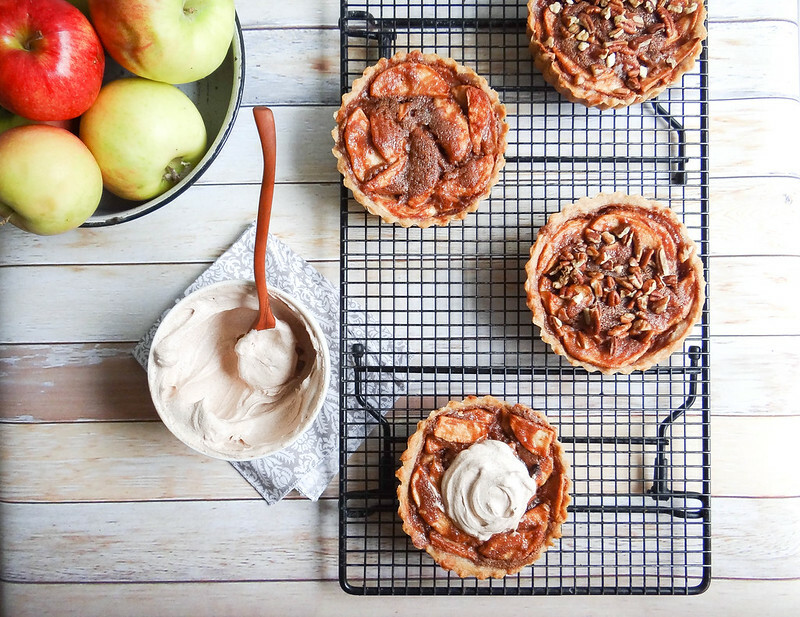 The nice thing about this recipe - it only makes 4 mini tarts, no worries about wasting or over indulging. Justin quite enjoyed himself and had one for breakfast the following morning. Dessert for breakfast- does it get any better? Do you have one thing that you absolutely love to do but your significant loathes? Trust me, someday I'll convince Justin to go apple picking- if I can get him to love vegan egg sammies anything is possible! 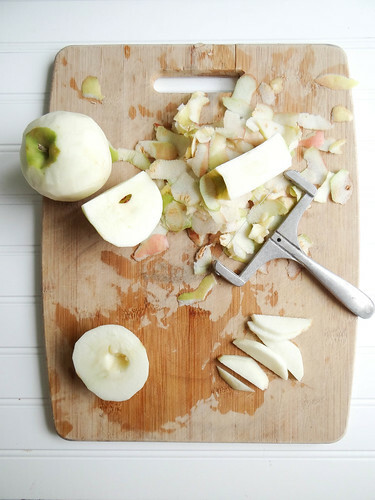 Peel and slice apples, place in a medium mixing bowl and toss with cinnamon and cornstarch- set aside. In a small sauce pan, add peanut butter, maple syrup and butter- melt over low heat until liquid and well combined. 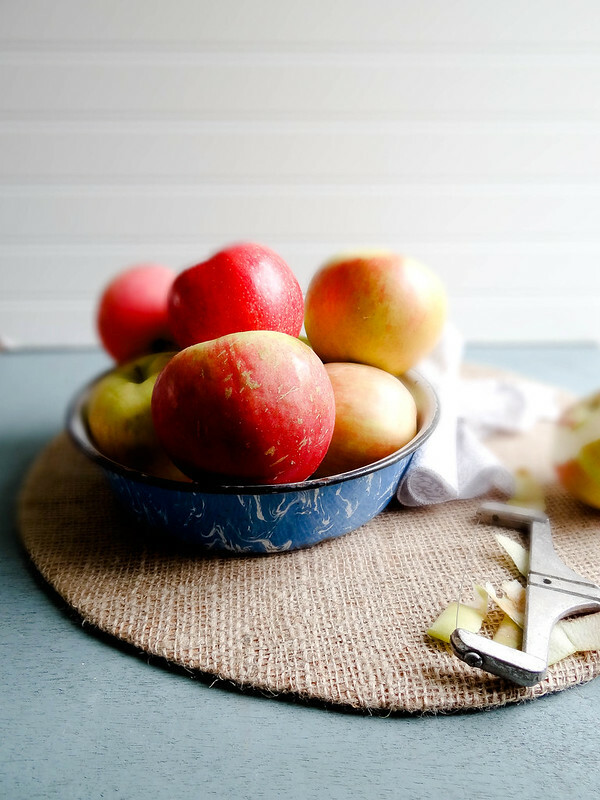 Pour over apples in mixing bowl and mix very well, coating all apples. Meanwhile, add flour and vegan butter to a food processor fitted with a dough blade. Pulse a few time until pea size bits of butter form in the flour. Add maple syrup, cinnamon, sea salt, pulse a few times. With the food processor running slowly add in the 1/4 cup of ice water until a dough begins to form (it should be some what tacky). Evenly divide the pastry dough between 4 mini round tart pans or 1 large tart pan with removable bottom. Using your fingers or the back of a spoon press dough evenly up the side and bottom of the pans (dough will be tacky). 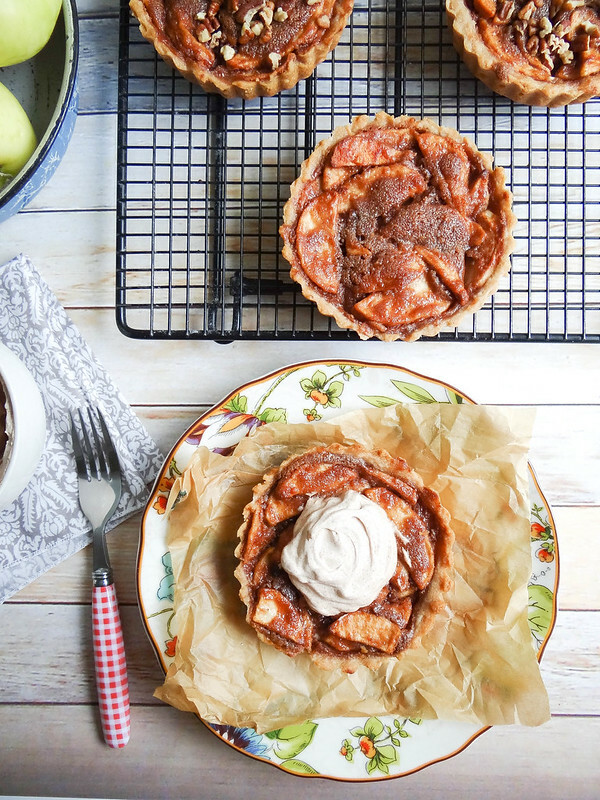 Divide the apple filling between each tart pan, albeit messy, hand layering will give you a better result. Drizzle the remaining peanut butter mixture over each tart (the leftover from the mixing bowl). Bake in a pre heated oven for 35-45 minutes (40 minutes for me). If you would like to add pecans, add them during the last 10 minutes of baking. Remove from Oven, allow to cool a bit prior to removing and serving with cinnamon whipped cream or vegan vanilla ice cream! 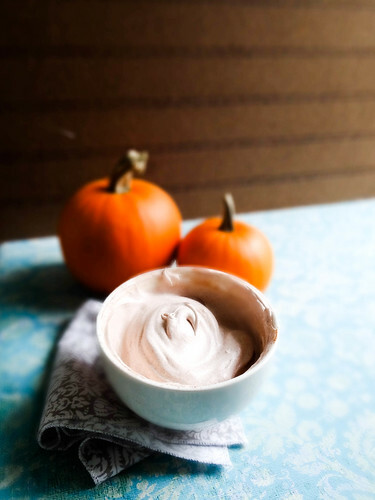 To make the whipped cream simply whip cinnamon into vegan whipped cream! Absolutely amazing looking! 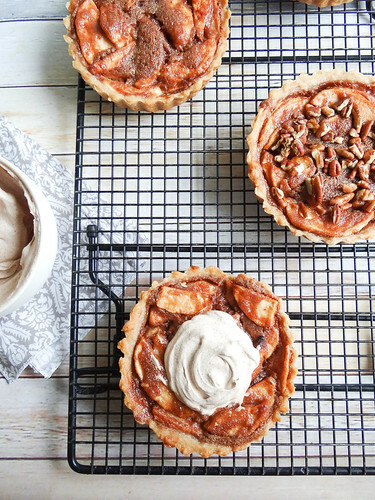 I've never been huge on pie, but I would totally be down for one of these tarts. I love that you added peanut butter! And that coconut topping, just wow. these look delicious! 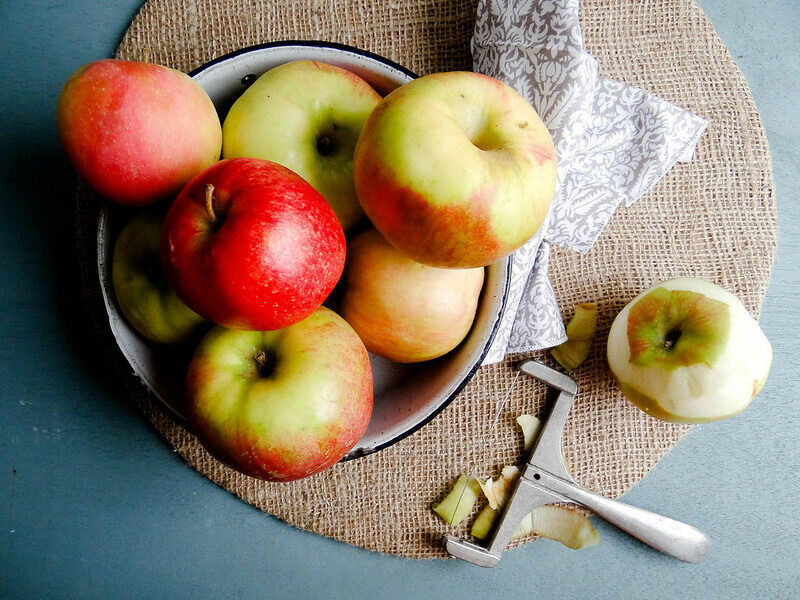 apples and peanut butter are one of my favorite combinations. These are stunning. 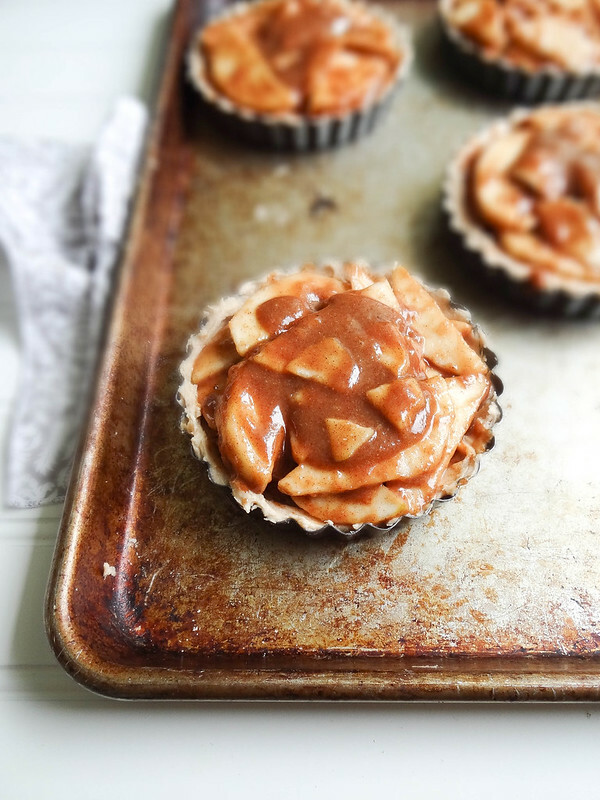 I love the simplicity of apple tarts! 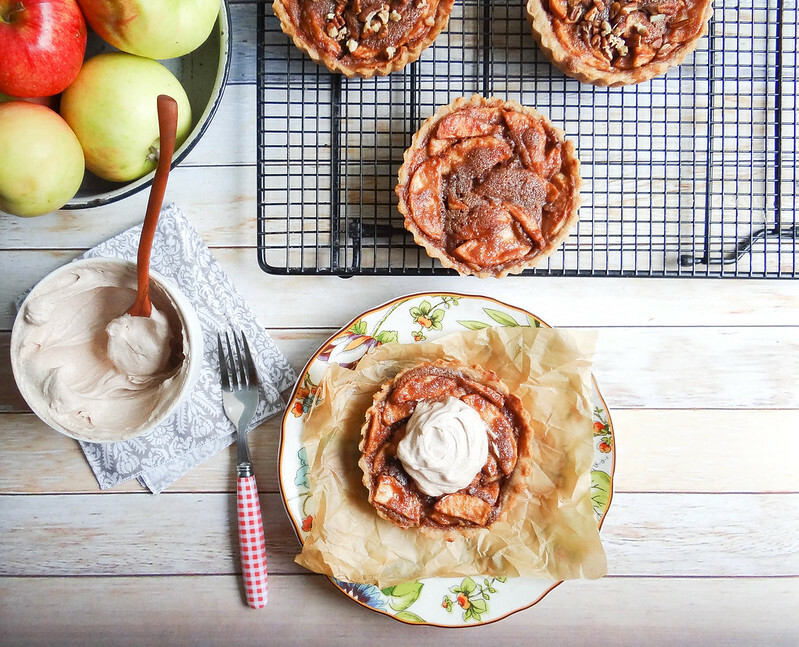 These apple tarts look incredible and I can imagine how good they would have tasted. Great recipe & Pinned! I would eat them all the time! where did you get the so delicious coconut whipped cream?